Swain County is located in Western North Carolina bordering the Tennessee state line. Swain County is in the midst of the Great Smoky Mountains National Park and also boasts the rural mountain town of Bryson City and the tribal town of Cherokee in addition to its abundance of preserved land. The music of Swain County is a mix of bluegrass, old time, gospel and Cherokee styles. Click here for more information about these historic figures and current Swain County musicians from the Blue Ridge National Heritage Area. Founded by the Smoky Mountain Music Association and hosted by Mountain Discovery Charter School in Bryson City, Swain County’s Junior Appalachian Musicians Program has been in existence since 2002. Rather than just offering single instrument instruction with a few group tunes to share, Petty and Wertheim have opted to bring together all intermediate players once a week. The program offers beginner and intermediate guitar, bass, mandolin, and singing in addition to an advanced string band class for older students. The advanced students usually record their work in the spring. 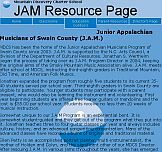 Swain County JAM at Mountain Discovery Charter School serves nearly 50 JAM students in grades 3-8 and also serves as a volunteering opportunity for high school students and community members. The program is offered on Tuesdays, Wednesdays, and Thursdays after school from 3:15-4:45. Students perform throughout the year for their community.